The efficient-market hypothesis was developed by Eugene Fama who argued that stocks always trade at their fair value, making it impossible for investors to either purchase undervalued stocks or sell stocks for inflated prices. As such, it should be impossible to outperform the overall market through expert stock selection or market timing, and that the only way an investor can possibly obtain higher returns is by chance or by purchasing riskier investments. His 2012 study with Kenneth French supported this view, showing that the distribution of abnormal returns of US mutual funds is very similar to what would be expected if no fund managers had any skill—a necessary condition for the EMH to hold. In weak-form efficiency, future prices cannot be predicted by analyzing prices from the past. Excess returns cannot be earned in the long run by using investment strategies based on historical share prices or other historical data. Technical analysis techniques will not be able to consistently produce excess returns, though some forms of fundamental analysis may still provide excess returns. Share prices exhibit no serial dependencies, meaning that there are no "patterns" to asset prices. This implies that future price movements are determined entirely by information not contained in the price series. Hence, prices must follow a random walk. This 'soft' EMH does not require that prices remain at or near equilibrium, but only that market participants not be able to systematically profit from market 'inefficiencies'. and that, moreover, there is a positive correlation between degree of trending and length of time period studied (but note that over long time periods, the trending is sinusoidal in appearance). Various explanations for such large and apparently non-random price movements have been promulgated. All the produced goods ought to be distributed to the individuals for whom they are most valuable. It is based on the idea that distribution of goods follows a principle in which “no one can be made better off without making someone else being made worse off”. Consequently, there does not occur a situation where trade or exchange could make two individuals better off. Trade is feasible when marginal rate of substitution of two individuals differs. However, in the case of exchange efficiency, the same marginal rate of substitution for all individuals is required. For competitive markets to reach exchange efficiency, each individual is supposed to always face the same price. Investors, including the likes of Warren Buffett, and researchers have disputed the efficient-market hypothesis both empirically and theoretically. Behavioral economists attribute the imperfections in financial markets to a combination of cognitive biases such as overconfidence, overreaction, representative bias, information bias, and various other predictable human errors in reasoning and information processing. These have been researched by psychologists such as Daniel Kahneman, Amos Tversky and Paul Slovic and economist Richard Thaler. These errors in reasoning lead most investors to avoid value stocks and buy growth stocks at expensive prices, which allow those who reason correctly to profit from bargains in neglected value stocks and the overreacted selling of growth stocks. 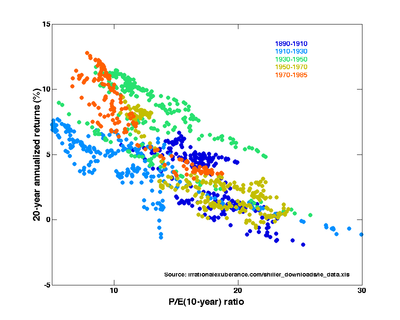 Empirical evidence has been mixed, but has generally not supported strong forms of the efficient-market hypothesis According to Dreman and Berry, in a 1995 paper, low P/E stocks have greater returns. In an earlier paper Dreman also refuted the assertion by Ray Ball that these higher returns could be attributed to higher beta,[clarification needed] whose research had been accepted by efficient market theorists as explaining the anomaly in neat accordance with modern portfolio theory. Behavioral psychology approaches to stock market trading are among some of the more promising alternatives to EMH (and some[which?] investment strategies seek to exploit exactly such inefficiencies). But Nobel Laureate co-founder of the programme Daniel Kahneman —announced his skepticism of investors beating the market: "They're just not going to do it. It's just not going to happen." Indeed, defenders of EMH maintain that Behavioral Finance strengthens the case for EMH in that it highlights biases in individuals and committees and not competitive markets. For example, one prominent finding in Behaviorial Finance is that individuals employ hyperbolic discounting. It is demonstrably true that bonds, mortgages, annuities and other similar financial instruments subject to competitive market forces do not. Any manifestation of hyperbolic discounting in the pricing of these obligations would invite arbitrage thereby quickly eliminating any vestige of individual biases. Similarly, diversification, derivative securities and other hedging strategies assuage if not eliminate potential mispricings from the severe risk-intolerance (loss aversion) of individuals underscored by behavioral finance. On the other hand, economists, behaviorial psychologists and mutual fund managers are drawn from the human population and are therefore subject to the biases that behavioralists showcase. By contrast, the price signals in markets are far less subject to individual biases highlighted by the Behavioral Finance programme. Richard Thaler has started a fund based on his research on cognitive biases. In a 2008 report he identified complexity and herd behavior as central to the global financial crisis of 2008. Economist John Quiggin has claimed that "Bitcoin is perhaps the finest example of a pure bubble", and that it provides a conclusive refutation of EMH. While other assets used as currency (such as gold, tobacco) have value independent of people's willingness to accept them as payment, Quiggin argues that "in the case of Bitcoin there is no source of value whatsoever". ^ Bergen, Jason Van (17 February 2004). "Efficient Market Hypothesis: Is The Stock Market Efficient?". Investopedia. ^ Staddon, John (2017) Scientific Method: How science works, fails to work or pretends to work. Taylor and Francis. ^ Fox, Justin (2009). Myth of the Rational Market. Harper Business. ISBN 978-0-06-059899-0. ^ a b Nocera, Joe (5 June 2009). "Poking Holes in a Theory on Markets". The New York Times. Retrieved 8 June 2009. ^ a b Lowenstein, Roger (7 June 2009). "Book Review: 'The Myth of the Rational Market' by Justin Fox". The Washington Post. Retrieved 5 August 2011. ^ Desai, Sameer (27 March 2011). "Efficient Market Hypothesis". Archived from the original on 6 June 2011. Retrieved 2 June 2011. ^ "Benoit mandelbrot on efficient markets (interview - 30 September 2009)". www.ft.com. Financial times. Retrieved 21 November 2017. ^ a b c d e Jovanovic, Franck (2012). "Bachelier: Not the forgotten forerunner he has been depicted as. An analysis of the dissemination of Louis Bachelier's work in economics". The European Journal of the History of Economic Thought. 19 (3): 431–451. doi:10.1080/09672567.2010.540343. ISSN 0967-2567. ^ Courtault, Jean-Michel; Kabanov, Yuri; Bru, Bernard; Crepel, Pierre; Lebon, Isabelle; Le Marchand, Arnaud (2000). "Louis Bachelier on the Centenary of Theorie de la Speculation". Mathematical Finance. 10 (3): 339–353. doi:10.1111/1467-9965.00098. ISSN 0960-1627. ^ Jarrow, Robert; Protter, Philip (2004). "A short history of stochastic integration and mathematical finance: the early years, 1880–1970". A Festschrift for Herman Rubin. Institute of Mathematical Statistics Lecture Notes - Monograph Series. pp. 75–80. doi:10.1214/lnms/1196285381. ISBN 978-0-940600-61-4. ISSN 0749-2170. ^ Kirman, Alan. "Economic theory and the crisis." Voxeu. 14 November 2009. ^ See Working (1934), Cowles and Jones (1937), and Kendall (1953), and later Brealey, Dryden and Cunningham. ^ Fama, Eugene (1965). "The Behavior of Stock Market Prices". Journal of Business. 38: 34–105. doi:10.1086/294743. ^ Samuelson, Paul (1965). "Proof That Properly Anticipated Prices Fluctuate Randomly". Industrial Management Review. 6: 41–49. ^ Schwager, Jack D. (19 October 2012). Market Sense and Nonsense: How the Markets Really Work (and How They Don't). John Wiley & Sons. ISBN 9781118523162 – via Google Books. ^ Collin Read (15 December 2012). The Efficient Market Hypothesists: Bachelier, Samuelson, Fama, Ross, Tobin, and Shiller. ISBN 9781137292216. ^ "The efficient market hypothesis: problems with interpretations of empirical tests". ^ Fama, Eugene (1970). "Efficient Capital Markets: A Review of Theory and Empirical Work". Journal of Finance. 25 (2): 383–417. doi:10.2307/2325486. JSTOR 2325486. ^ Jung, Jeeman; Shiller, Robert (2005). "Samuelson's Dictum And The Stock Market". Economic Inquiry. 43 (2): 221–228. CiteSeerX 10.1.1.65.9446. doi:10.1093/ei/cbi015. ^ Granger, Clive W. J.; Morgenstern, Oskar (5 May 2007). "Spectral Analysis Of New York Stock Market Prices". Kyklos. 16 (1): 1–27. doi:10.1111/j.1467-6435.1963.tb00270.x. ^ Jegadeesh, N; Titman, S (1993). "Returns to Buying winners and selling losers: Implications for stock market efficiency". Journal of Finance. 48 (1): 65–91. doi:10.1111/j.1540-6261.1993.tb04702.x. ^ Jegadeesh, N; Titman, S (2001). "Profitability of Momentum Strategies: An evaluation of alternative explanations". Journal of Finance. 56 (2): 699–720. doi:10.1111/0022-1082.00342. ^ Fama, E; French, K (1996). "Multifactor explanation of asset pricing anomalies". Journal of Finance. 51 (1): 55–84. doi:10.1111/j.1540-6261.1996.tb05202.x. ^ Fama, E; French, K (2008). "Dissecting Anomalies". Journal of Finance. 63 (4): 1653–78. doi:10.1111/j.1540-6261.2008.01371.x. ^ Kleinberg, Jon; Tardos, Eva (2005). Algorithm Design. Addison Wesley. ISBN 978-0-321-29535-4. ^ a b c d E., Stiglitz, Joseph (2000). Economics of the public sector (3rd ed.). New York: W.W. Norton. ISBN 978-0393966510. OCLC 39485400. ^ Gregory., Mankiw, N. (2007). Principles of microeconomics (4th ed.). Mason, OH: Thomson South-Western. ISBN 978-0324319163. OCLC 65655185. ^ Brueckner, Jan K. (1982). "A Test for Allocative Efficiency in the Local Public Sector" (PDF). Journal of Public Economics. 19 (3): 311–331. CiteSeerX 10.1.1.485.7394. doi:10.1016/0047-2727(82)90059-7. ^ Brian., Dollery (2001). The political economy of local government. Wallis, Joe (Joe L.). Northampton, MA: Edward Elgar Pub. ISBN 978-1840644517. OCLC 46462759. ^ a b Shiller, Robert (2005). Irrational Exuberance (2d ed.). Princeton University Press. ISBN 978-0-691-12335-6. ^ Burton G. Malkiel (2006). A Random Walk Down Wall Street. ISBN 0-393-32535-0. p.254. ^ "Here's What Warren Buffet Thinks About The Efficient Market Hypothesis". Business Insider. Francis Nicholson. Price-Earnings Ratios in Relation to Investment Results. Financial Analysts Journal. Jan/Feb 1968:105–109. Basu, Sanjoy (1977). "Investment Performance of Common Stocks in Relation to Their Price-Earnings Ratios: A test of the Efficient Markets Hypothesis". Journal of Finance. 32 (3): 663–682. doi:10.1111/j.1540-6261.1977.tb01979.x. Rosenberg B, Reid K, Lanstein R. (1985). Persuasive Evidence of Market Inefficiency. Journal of Portfolio Management 13:9–17. ^ a b Fama, E; French, K (1992). "The Cross-Section of Expected Stock Returns". Journal of Finance. 47 (2): 427–465. doi:10.1111/j.1540-6261.1992.tb04398.x. ^ Chan, Kam C.; Gup, Benton E.; Pan, Ming-Shiun (4 March 2003). "International Stock Market Efficiency and Integration: A Study of Eighteen Nations". Journal of Business Finance & Accounting. 24 (6): 803–813. doi:10.1111/1468-5957.00134. ^ Dreman David N.; Berry Michael A. (1995). "Overreaction, Underreaction, and the Low-P/E Effect". Financial Analysts Journal. 51 (4): 21–30. doi:10.2469/faj.v51.n4.1917. ^ Dreman D. (1998). Contrarian Investment Strategy: The Next Generation. Simon and Schuster. ^ Thaler RH. (2008). 3Q2008 Archived 20 March 2009 at the Wayback Machine. Fuller & Thaler Asset Management. ^ Hirshleifer, David A.; Shumway, Tyler (June 2003). "Good Day Sunshine: Stock Returns and the Weather". Journal of Finance. 58 (3): 1009–1032. doi:10.1111/1540-6261.00556. SSRN 411135. ^ "A Non-Random Walk Down Wall Street". Princeton University Press. ^ Hurt III, Harry (19 March 2010). "The Case for Financial Reinvention". The New York Times. Retrieved 29 March 2010. ^ Quiggin, John (16 April 2013). "The Bitcoin Bubble and a Bad Hypothesis". The National Interest. ^ "Herausforderung künstliche Intelligenz". 9 November 2015. ^ GmbH, finanzen.net. "Datenschutz: Wir brauchen Schutz vor künstlicher Intelligenz - 12.10.15 - BÖRSE ONLINE". ^ Hoffman, Greg (14 July 2010). "Paul the octopus proves Buffett was right". Sydney Morning Herald. Retrieved 4 August 2010. ^ "Sun finally sets on notion that markets are rational". The Globe and Mail. 7 July 2009. Retrieved 7 July 2009. ^ Paul Volcker (27 October 2011). "Financial Reform: Unfinished Business". New York Review of Books. Retrieved 22 November 2011. ^ Siegel, Laurence B. (2010). "Black Swan or Black Turkey? The State of Economic Knowledge and the Crash of 2007–2009". Financial Analysts Journal. 66 (4): 6–10. doi:10.2469/faj.v66.n4.4. Quote on p. 7. ^ "Has 'guiding model' for global markets gone haywire?". Jerusalem Post. 11 June 2009. Archived from the original on 8 July 2012. Retrieved 17 June 2009. ^ Stevenson, Tom (17 June 2009). "Investors are finally seeing the nonsense in the efficient market theory". The Telegraph. ^ "After the Blowup". The New Yorker. 11 January 2010. Retrieved 12 January 2010. ^ Sommer, Jeff (28 June 2014). "Are Markets Efficient? Even the Supreme Court Is Weighing In". The New York Times. ^ Liptak, Adam (23 June 2014). "New Hurdle in Investors' Class Actions". The New York Times. Cowles, Alfred; H. Jones (1937). "Some A Posteriori Probabilities in Stock Market Action". Econometrica. 5 (3): 280–294. doi:10.2307/1905515. JSTOR 1905515. Kendall, Maurice. "The Analysis of Economic Time Series". Journal of the Royal Statistical Society. 96: 11–25. Khan, Arshad M. (1986). "Conformity with Large Speculators: A Test of Efficiency in the Grain Futures Market". Atlantic Economic Journal. 14 (3): 51–55. doi:10.1007/BF02304624. Malkiel, Burton G. (1987). "efficient market hypothesis," The New Palgrave: A Dictionary of Economics, v. 2, pp. 120–23. Pilkington, P (2017). The Reformation in Economics: A Deconstruction and Reconstruction of Economic Theory. Palgrave Macmillan. Samuelson, Paul (1972). "Proof That Properly Anticipated Prices Fluctuate Randomly." Industrial Management Review, Vol. 6, No. 2, pp. 41–49. Reproduced as Chapter 198 in Samuelson, Collected Scientific Papers, Volume III, Cambridge, M.I.T. Press. Sharpe, William F. "The Arithmetic of Active Management"
Working, Holbrook (1960). "Note on the Correlation of First Differences of Averages in a Random Chain". Econometrica. 28 (4): 916–918. doi:10.2307/1907574. JSTOR 1907574. "As The Index Fund Moves from Heresy to Dogma . . . What More Do We Need To Know?" Remarks by John Bogle on the superior returns of passively managed index funds.